Formerly the Heritage Motor Museum, The British Motor Museum (BMM) based in Warwickshire, is home to the world’s largest collection of British Cars. Boasting nearly 300 cars in a collection which spans the classic, vintage and veteran eras, it is a mecca for car enthusiasts. Apart from the UK’s finest car museum, BMM is also one of the largest and most impressive conference centres in the Midlands for meetings, exhibitions and events. BMM’s modern, flexible event space is combined with a fascinating showcase of British motoring history – making it a truly unique event experience for up to 5,000 guests. Focusing on BMM’s conference centre, which is the primary source of income for the venue, S2 was tasked to research the customer base and identify new business opportunities through intelligence gained from the insight. Once we had a better understanding of BMM’s customer and prospect base by geography and customer profile, we worked with the BMM team to create a range of visually appealing, quirky and aesthetically pleasing omnichannel communication material. We designed and built an interactive responsive website which works across mobiles, tablet and laptop devices. The use of high quality imagery taken at various photo-shoots throughout enhances the visual tone of the site, adverts, exhibition design and social media elements. This work now showcases their excellent conference and meeting facilities in addition to the fabulous, world renowned museum of British cars on site. 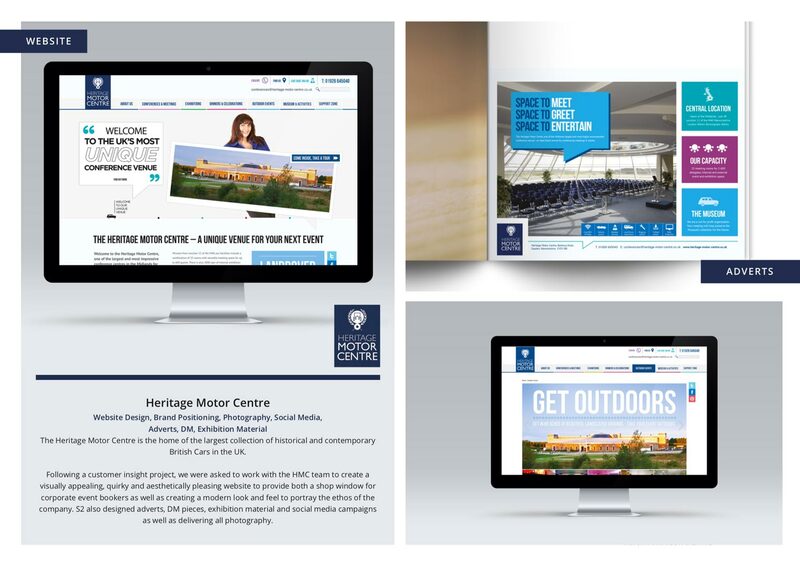 The British Motor Museum now has a much better understanding of its customer base and an easily navigable website that performs for multiple user types across all key platforms, allowing them to access all areas of the site in a structured and visually exciting way. Other on and offline collateral was created including exhibition material, printed menus, social media, advertising, photography and email campaigns. Traffic to the site and corporate bookings have increased substantially.